SHANGHAI/LONDON (Reuters) - China's central bank launched spot checks on leading bitcoin exchanges in Beijing and Shanghai, ratcheting up pressure on potential capital outflows and knocking the price of the cryptocurrency down more than 12 percent against the dollar. While the yuan lost more than 6.5 percent against the dollar last year, its worst performance since 1994, the bitcoin price has soared to near-record highs. Separately in Shanghai, the PBOC said it visited BTCC, noting its checks "focused on whether the firm was operating out of its business scope, whether it was launching unauthorised financing, payment, forex business or other related businesses, whether it was involved in market manipulation, anti-money laundering or (carried) fund security risks." 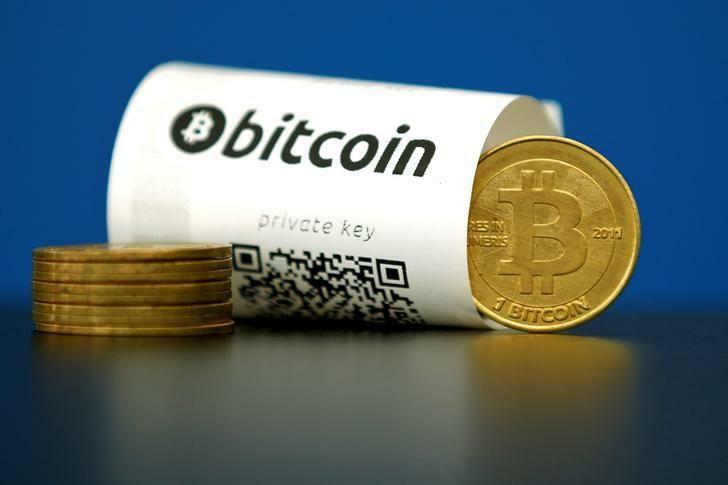 On the Europe-based Bitstamp exchange, the price of bitcoin fell as much as 12.5 percent to a 3-week low of $800. On China's Huobi exchange, the price slid more than 16 percent to 5,313 yuan, equivalent to around $766, putting the yuan/bitcoin rate at a discount to the rate on dollar-based exchanges. Normally, bitcoin trades at a premium in China, with a lack of trading fees encouraging volumes and boosting demand. "Selling is being driven by China. The fear is that ... this investigation could lead to, worse-case scenario, funds being withheld from them (Chinese investors) or one of the exchanges being found to have acted improperly," said Charles Hayter, CEO of digital currency analytics firm Cryptocompare. "This is a ratcheting up of the rhetoric from the Chinese authorities - instead of 'we're watching' you, it's now 'we're investigating' you," he said. According to his analysis, Hayter says trading between the yuan and bitcoin accounted for around 98 percent of the total market in the past six months. "The long term implications of this are positive as more rigour in the Chinese market only matures and brings respectability to the industry - but in the short term this could effect volumes which have been one of the key drivers of the recent rally," Hayter added. Bobby Lee, CEO of Shanghai-based BTCC, confirmed the PBOC visit, but said he believed the company was not out of line. "We're definitely vigilant. We think we are in compliance with all the current rules and regulations of running a bitcoin exchange in China," he told Reuters by phone. "I wouldn't call it an investigation. I think they are working closely with us to learn more about our business model and the bitcoin exchange industry. We had a very fruitful meeting today," Lee said.